From July 21st of 2011, we will be opening the KANEKO Tomiyuki Exhibition in Nakameguro, Mizuma Action. The decision towards exhibiting “Yokai Substantiations” in Mizuma Action was sudden as the building was soon to be closed. recently devastated Tohoku-Yamagata region. His material sources are mainly yokai (specters) and spirits. Yokai were born from the lands and the everyday life in multiple cultures of Japan. They sometimes indicate the hidden secrets in between the lines of documented history, and sometimes, let us know the evil coming heading towards our way. Yokai are a part of history in the local customs, told on by the civilians rather than the rulers. What messages are we able to receive from the yokai, in this modern, changing era? 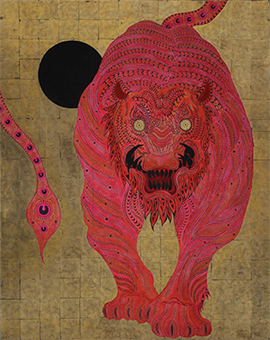 KANEKO Tomiyuki was born in Saitama prefecture, 1978. Since childhood, he has been particularly interested in Japanese folklore and the spiritual world. His interest has led him to study in the Tohoku prefecture, which was the birthplace of “Legends of Tono”. As an undergraduate student he studied Japanese style painting in Tohoku University of Art & Design and graduated the postgraduate of the same university in 2009. Even after he finished studying, he continues to “substantiate” mythological creatures such as: yokai, spirits and the gods by painting. In this first exhibition at Mizuma Action, as well as his representative work, his most recent works will be exhibited. Varying from drawings to the many detailed paintings that visualize his personal visions of the Yokai world will cover and fill the walls. stratum, “Alaya-vijinana”, “Manas-vijinana” is the unique feature of human and the unconscious emotion of attachment. It is always around us and constantly puts us into trickery. However, this unconscious emotion of attatchment is what makes humans human. The human’s strength to struggle is where all art is created, and by intercrossing with localized imagination it has formed as the yokai. Please come to our gallery to speculate the observing eye of KANEKO Tomiyuki, and the wonderful world of the yokai.